Bryan County May not be nearly as well-known as its eastern neighbor Chatham County, home to tourist-friendly Savannah, but these days people and businesses are finding this community near the coast a great place to be. Driven by two big economic engines – the Port of Savannah and the U.S. Army’s Fort Stewart – the county is capitalizing on its location. It’s just a 20-minute drive from the southern reaches of the county to the port, however land is less expensive here than in Chatham County. Location also helps explain why this region has fared better than many parts of the state during the recession. Now that a recovery seems to be underway, it may do better still. “We’re in a recovery mode, and it’s been rather slow,” admits Bryan County Commission Chairman Jimmy Burnsed, but the pace has been picking up lately, he adds. Local economic development officials say they’re getting a flurry of inquiries and, even better, seeing companies move in to set up shop, while established firms are expanding their head count. The county is also poised for some substantial residential growth as well. According to U.S. Census figures, the population is expected to rise from about 33,000 now to more than 41,000 by 2025. “That’s a tremendous amount of growth that they’ve experienced over the past several years,” says County Administrator Ben Taylor. The county’s economic powerhouse, Fort Stewart, has been pumping money into the economy and creating trained workers for industry since the early 1940s. According to a 2012 Pentagon report, the fort provided $5.2 billion in economic impact for the surrounding area. It has also created a geographical anomaly in Bryan. The military reservation effectively cuts the county in half – one of only two counties in the nation where that occurs. To get from one end of Bryan County to the other, residents have to drive completely outside the county and around Fort Stewart. The divide has created challenges for county government and the local school system, both of which must have two of most everything when it comes to services. With the courthouse in the northern part of the county in Pembroke, there’s a need for county facilities in Richmond Hill in the south end. The local school system has also had to duplicate facilities – such as bus barns and maintenance shops – in the two ends. Thanks to proximity to the ports and to Savannah, the southern part of the county is where most of the growth is happening and where most new development is likely to take place. The two-lane road outside the administration building is set to be widened to four lanes to accommodate a volume of traffic resulting from more business, schools and recreation facilities that now line the street. As a small county with a $20-million budget, it’s been “difficult to get everything done that needs to get done to keep this growth going,” Burnsed adds. As a harbinger of economic prosperity, local officials point to the decision by Israeli-based Caesarstone to move to Richmond Hill. The quartz countertop maker is building a new plant in the Belfast Commerce Centre that will eventually employ 180 workers. Company officials say the first line will be in production by the second quarter of 2015, with the second production line to be operational by the fourth quarter. The Georgia Economic Development Association named the Caesarstone move the Deal of the Year for 2014 in the 50,000 and under population category. The firm is the first of what is expected to be a stream of new companies setting up shop in the sprawling industrial park, which is adjacent to a massive 3,467-acre mixed-use site east of Hwy. 144. It’s owned by TerraPointe Services, the real estate arm of Rayonier, the timber and paper giant, which has found new uses for land that was once devoted just to trees. At the heart of the development is a 1,100-acre industrial park, the largest rail-served site in the Savannah market. It’s been approved for 10.5 million square feet of industrial, manufacturing, warehousing, distribution, office and commercial property. “It’s part of a large-scale planned unit development district called Belfast Commerce Centre,” says Michael Bell, director of economic development for Rayonier. The project has the look of the right place at the right time. It’s situated along a section of I-95 where the Georgia Department of Transportation is planning to build a new interchange. The area is also served by a rail line connected to the Port of Savannah. Along with being an attractive location for warehousing, logistics and manufacturing companies, the area will also become home to a bevy of mixed-use retail and residential projects. A great deal of careful planning has gone into making the site as attractive as possible to new companies. First it went through a process called Georgia Ready for Accelerated Development (GRAD) certification, which means that prospective clients can be assured that all geotech work, environmental studies and other legal requirements that often slow down development have been taken care of. This big project has also been getting the full attention of local governments. Richmond Hill annexed the site into its limits and is now building a $24-million wastewater treatment facility that will be able to serve the expected development. The northern end of Bryan has also gotten its share of development. At the Interstate Centre just off I-16, firearm maker Daniel Defense is busy expanding its production line with a $20-million investment and adding 120 more workers. In 2000, the company began in a small manufacturing facility in Chatham County and moved all operations to Bryan County in 2009. Officials say employment will rise to 284 by 2018. “It’s going to allow them to increase their production of private firearms and grow research and development operations in Georgia,” says Anna Chafin, CEO of the Development Authority of Bryan County. The county won another victory with the decision by West Penn Testing Group to locate a 30,000-square-foot testing center at Bryan County’s Interstate Centre industrial park. The business will invest $3 million and bring 70 jobs over the next five years. This nondestructive testing center will use immersion ultrasonic, magnetic particle, etch, fluorescent and visible penetrant inspection to evaluate the quality and integrity of raw materials and components for markets including aerospace, power generation, medical and general industrial. The company was attracted to the area for its location, low cost of doing business and the ready availability of both workers and training from nearby Savannah Technical College and Georgia Quick Start, one of the nation’s top workforce training programs. Among other businesses that have geared up recently, Agri Supply just opened a distribution center in the county. Blue Bell Creamery operates a transfer station and distribution point, while DKW Logistics distributes recreation vehicles and accessories for Kawasaki. In fact, the entire county has benefited from the popularity of the Port of Savannah. As distribution companies have snapped up available space around the port, outlying areas along the interstates have become increasingly attractive. “Industrial land in the Savannah market is becoming more limited, and so people are not really seeing a major disadvantage to coming a little further out,” Chafin says. Proximity to the port means access to the rest of the world. 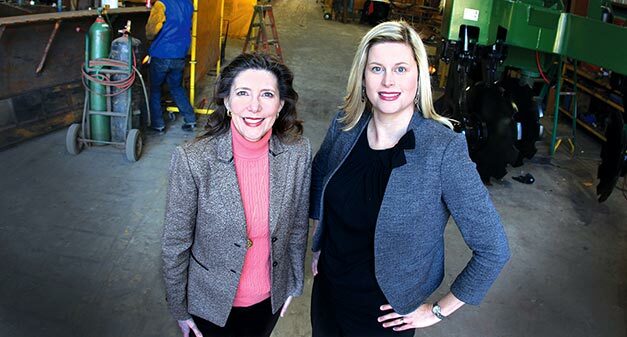 Pembroke-based Savannah Global Solutions, a provider of forestry equipment, was named the 2014 Exporter of the Year by the Georgia Small Business Administration. The company has been able to expand internationally to countries including Brazil. Despite its name, the company relocated to Pembroke’s J.D. Harn Industrial Park from Savannah in 2012 and has since doubled its employment. Costs to locate in the industrial park have become even lower thanks to the tax advantages of its inclusion in the Military Zone surrounding Fort Stewart. Fort Stewart and its influx of personnel have contributed to a possible housing shortage in Bryan. The number of county building permits, which fell by two thirds in 2008, are rising again. While they’re nowhere near pre-recession levels, they are indicative of a growing demand for housing. While the city and county did experience a downturn in the residential real estate market, this slowing was due more to the lack of homes rather than a demand-driven slow down, according to Richmond Hill City Manager Chris Lovell. A great many of the homes and apartments are being occupied by personnel from Fort Stewart. With only a limited amount of on-post housing available, most are seeking rental property. The county school system is also seeing steady growth, fueled in part by the comings and goings of military personnel and their families. That and the housing growth are just two assets the county can build on as it moves forward. And while Bryan County might be divided geographically, it has increasingly come to think and act as one. Honoring the Military: “We have big plans,” declares Pembroke Mayor Mary Warnell. In the north end of this divided county, the city of Pembroke is working hard to revitalize its downtown and attract more people and industry. When Mayor Mary Warnell took office in 2012, the city was in the midst of applying for a U.S. Department of Agriculture grant to complete the fourth and final phase of its new sewer system. Over the past year and a half, the city has gotten the funds to complete the project and also tackle a severe drainage problem. Four state highways passing around the city were draining into a city system that was unable to accommodate the flow. Pembroke, the county seat, is also in the process of building a new public safety complex for police, fire and EMS services. Local residents will also soon have access to the new Veterans Memorial Park, named in honor of the many military personnel who have trained and served at Fort Stewart over the decades. The park will also help to serve as a beautified entrance into the city of about 2,300 people. The new park will be both a gateway into the city and an interactive experience, according to the mayor.